Johnson O’Connor Feron & Carucci has been a highly regarded, regional accounting firm on Boston’s North Shore for 70 years. Despite having earned steady growth and success, the firm was hampered by low market awareness, hindering up-market growth and recruitment efforts. They turned to Stackpole to lead them a comprehensive brand refresh featuring a more robust and engaging web presence. An extensive discovery process lead to a recommendation that the brand evolution begin with a change of the firm’s name. A more concise and memorable shorter name was recommended to more accurately reflect the firm’s scale to establish a semantic “short-hand” in the minds of current and potential clients. The brand name is now Johnson O’Connor, the name by which they were already commonly referred. The name change was followed by a logo refinement that took into consideration existing equity in color palette, along with design elements that had been incorporated into a newly designed office space. Stackpole updated the typography and created a new logo that is fresh and bold. 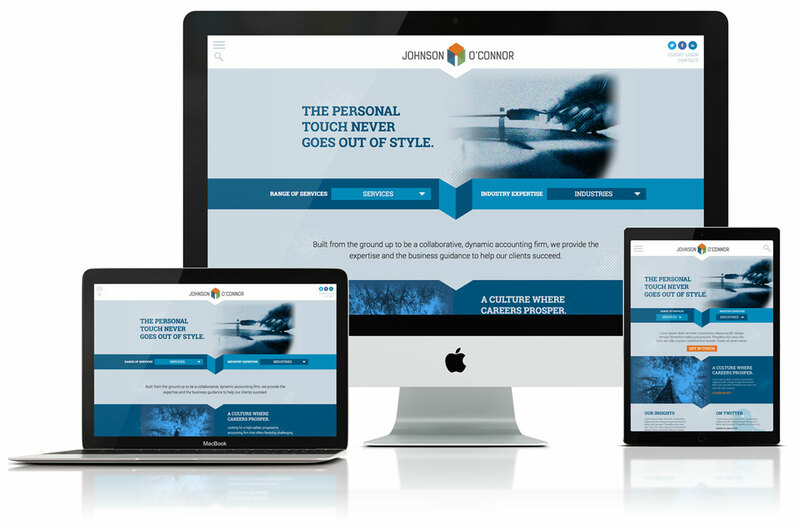 The most impactful element of our integrated creative strategy was the launch of a new website for the firm. An engaging, responsive design site was implemented to create an optimal user experience across all devices, while incorporating SEO best practices. Additionally, enhanced content featuring firm services and industries serviced, along with an entire section devoted to firm recruitment were crafted. To optimize the impact of a revitalized brand and website, Stackpole recommended both an external media launch and an internal branding launch. The public launch consisted of strategically placed print ads, digital ads and a public relations campaign designed to promote the new brand to strategically targeted media in both digital and regional print publications. An internal branding campaign was developed to help the firm successfully communicate the brand evolution to their employees. Working with Johnson O’Connor, Stackpole unveiled the new logo, identity system, website and careers video in a company-wide presentation during the annual “Firm Day” meeting. After the big reveal, employees were gifted with a kit of branded items such as mugs, water bottles and laptop cases to encourage additional internal buzz and excitement around the new brand. An established and venerable firm is energized by more dynamic branding, yielding new energy internally and a revived external presence.